I don't know if its a good thing or a bad thing that I work around the corner from a TJ Maxx and a Marshall's. I would say that's a good thing because it's super convenient to just drop by to pick up essentials when I need them. On the other hand they are full of crap I don't need but want. Just the other day I stopped by because the front door was calling my name. Do I want them? Yup, I could find a use for them plus they are pretty and oh how I love the nailheads. Results- For now they stay at the store and not in my cart, I have so much more of the store to see why stop now. Do I really need more frames? ehh not really, I have about 100 in storage boxes somewhere. Speaking of storage, where are those boxes anyways? I really should find them. I feel like I have a ton of crap in boxes that I could love again. ok, back on track with these frames. Do I want them? Umm, they had me at spray paint- of course I want them! Results- stay at store for now, vow to find the storage boxes. Do I need these? I don't give a crap if I need these- they are Martha and they are cute. I could always use more craft supplies to collect dust in my labeled craft boxes at home. Do I really need lamps? I have no room for them. I have no room for them. I. have. no. room. for. them. Do I want them? Hell yes I want them- but I think the fiance might kill me if I bring something else home and tell him it's my inspiration for a new design in the apartment. Do I want them? Um, is the sky blue? Of course I want them they are my favorite color. Results- I don't even cook, maybe these should stay at the store till I start cooking. Meaning, it will be a cold day in hell before these come home with me. 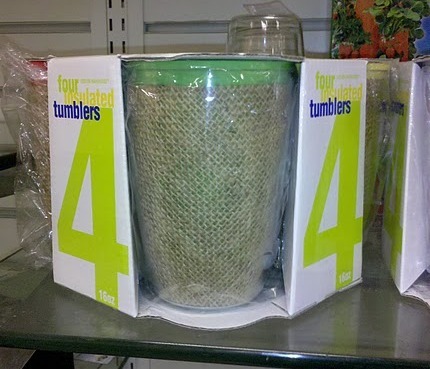 Do I really need plastic tumblers? I don't have a patio right now, but I will some day so maybe these should go in a "someday box". Speaking of, I don't have a "someday box" I should go to Target after this and get some new storage bins to make into my "someday box". Note to self, don't forget to look for the storage boxes AND make a "someday box"
Results- Who am I kidding? I won't need tumblers, I'll need wine glasses and margarita glasses. These are staying at the store. 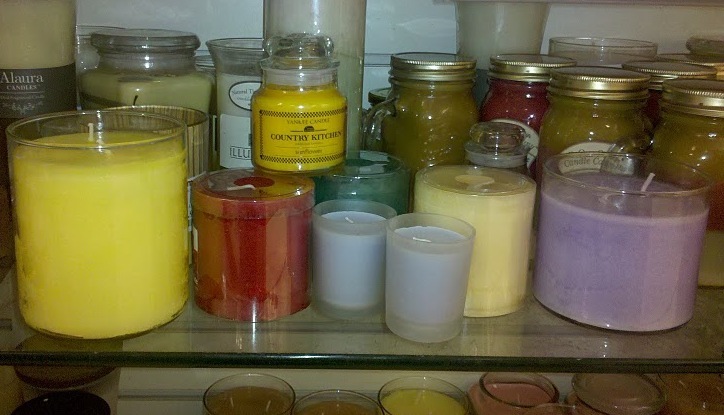 Do I really need another candle? Well these do get used up, and the point is to light them. So yes I really NEED another candle. Plus, I spy a pretty orange one. I think I need an orange intervention. OK, you get the idea. I could literally do this for every item in the store. It's like I'm asking for a mental breakdown every time I walk in a home store. I know I'm not the only one out there who does this. Don't all come forward at once now. Whoo, I feel better now! Love this post! Hysterical title. I once had a client who said, "I can like something without having to have it." That has stuck with me, though she did have like a couple billion dollars (really), so easy to say, right?! 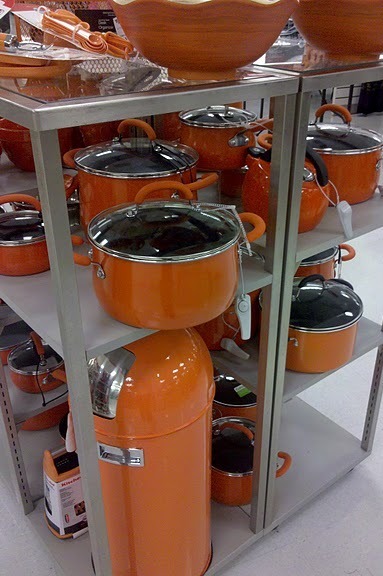 I have the exact same problem, except I show less restraint -- because I bought a set of those orange pots in the robins egg blue color last time I was there. I was shopping for a bedskirt, which I didn't find, and came home with $100 in new cookware instead. Its an addiction with no cure! PS I succumbed to a want just the other day and it is on its way via UPS. Take a look at my blog and you will see my little pretties, I am getting for a Someday. Lordy, I know this feeling all too well. I can't get out of a Target or HomeGoods w/o spending at least $20! I do the same, but somehow all the things I need stay there, and all the crap I really don't - comes home with me. Pppffft! I can't believe you left all that great stuff behind! Last time I went to TJ Maxx (Thursday) I bought a leather jacket (it was 102 degrees in StL that day), a giant apothecary jar (my 5th, but it was $10! ), and two crystal skull candle holders (it's barely August and I'm already planning for Halloween). Oh, and a TJ Maxx credit card. Whoops. TJ Maxx/Homegoods/Marshalls is the devil. 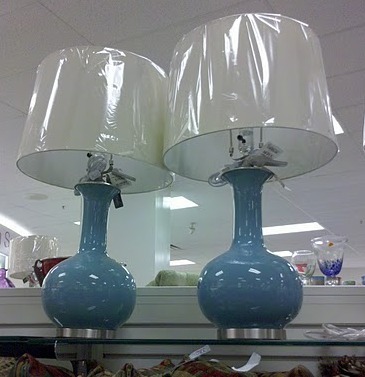 I would have faced the firing squad for those lamps. And no doubt, anything Martha would've made it into my basket too. Um, you are hilarious and you know what? I just saw that green chair last friday and thought the SAME thing. haha...we always want though, right? you are so funny. I had to shield my eyes from a TJ's today in Cambridge. ha! I have this same dilemma all the time! In fact I blogged about it on my inspiration blog just last week! At least that's what I call it...inspiration....or lust. hahaha. You crack me up. These are the thoughts crowding out legit stuff in my brain EVERY DAY. Because if I'm not near a store like that, I'm near a COMPUTER!! SAVE ME!!! 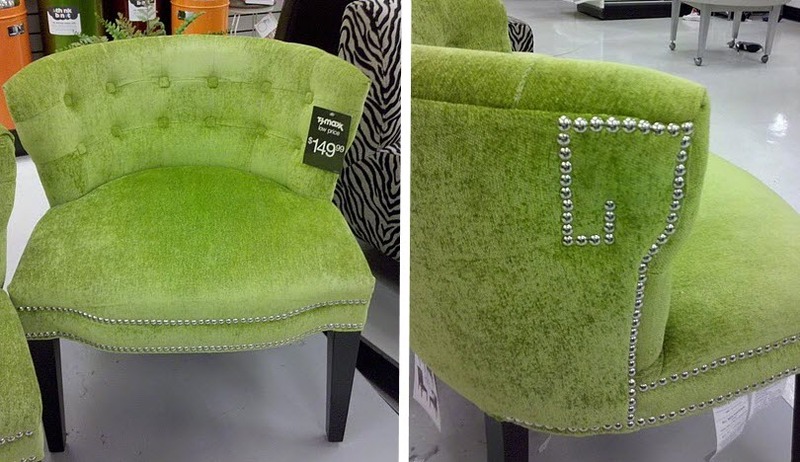 Hehe, I want the green chairs too!! Yes... I have the same problem too! Can't decide what to get!! Keep up your lovely posts! haha this is DEAD ON! Just wait till you walk in the Homegoods/TJ Maxx in Raleigh. You'll die. I was just at TJ Maxx and had the same conversation with myself. I feel your pain like whoa. Haha! Definitely a conversation I have with myself often!! I love this post! I feel the same way when I go to TJs or Homegoods - bc you know if you want it and go back for it, it won't be there anymore! I too live in the Boston area - this looks like a great Homegoods - if you don't mind me askingm where is it? This is hysterical, and I'm fairly certain we share a few of the same braincells.. this is exactly the conversations I have with myself every time I'm at homegoods... sometimes I tell myself I have to drive all the way across town (only 15 mins) to go to homegoods, just so I can save my boyfriend from having to live with more fabulous decor items. Homegoods really is an obsession. You are hilarious and you speak my language! Not only is there treasure to be found at Homegoods, but then you have the whole rationalization about price - oh I can drive myself crazy there! I have a 10 foot long table and 8 wonderful garden chairs that I bought at the last antique show where I was set up to SELL, not BUY, that I am saving for my SOMEDAY screened in porch that overlooks the hills of the Texas countryside, or if I really want to dream, it might be in Maine. I can just see my family and friends sitting at that table laughing and talking and eating and drinking wine......and it is all for SOMEDAY!! This post is too funny, probably because I relate to it so well. If the debate that goes on inside my head was happening out loud, I'd be "sent away" for sure. So much for retail 'therapy', I need therapy after I've been shopping. I actually walk around with things and carry them around the store while I look and 99% of the time I put everything back and leave empty handed. It's a curse. Best.Post.Ever!! I feel the same exact way, only you said it in a better and funnier way than I ever could! 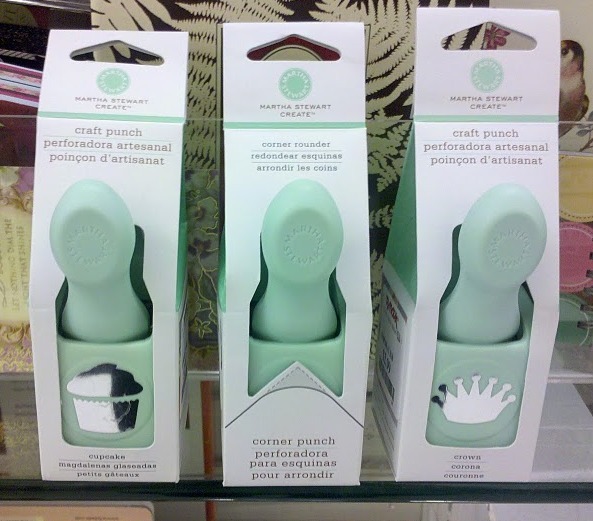 This is EXACTLY what all of my trips to TJ Maxx / HomeGoods are like! I'm always texting my mom photos so she can talk me into / out of things! Love the chairs and those lamps! 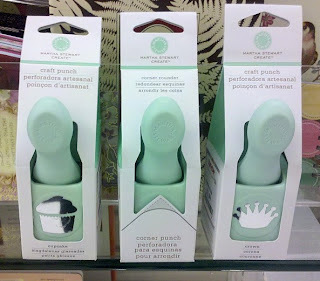 Here we have Winners, which is close to a TJ Maxx and they have great home accessories. The only thing I hate is that they put their price stickers on the glass of photo frames and it's almost impossible to get off! lol...totally have similar arguments with myself all the time whenever I go shopping. Those greek key chairs are great, but I'd definitely want to reupholster...which probably means I wouldn't buy them either as I'm terribly lazy about that (and have a stack of projects already cluttering up my spare room). This is so true!!! I go through this about every time I go to Target or Homegoods! Luckily you have more restraint than I do...I don't have a patio either but those tumblers are so cute I might have been forced to take them home with me! HA I think all women do this...and perhaps some guys! 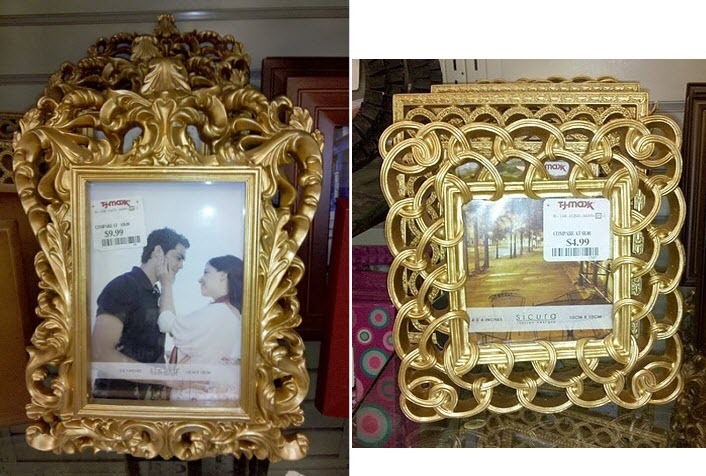 i loooove the gold frame with the circles! Oh how I wish there's been a TJ's when I lived in Boston! I would have been right there with the need vs. want dilemma! This post is cracking me up. I have way too many frames stored away, no need for lamps (but have admired the same ones in a more turquoise color) and love the crown hole punch. Sigh. I do this all.of.the.time in TJ Maxx. LOL!!! I have these same conversations with myself all the time!